This entry was posted by Ron on Friday, May 2nd, 2008 and is filed under General. Use this RSS 2.0 feed to follow responses to this entry. You can leave a response below, or trackback from your own site. CONGRATULATIONS! He’s so cute!!! Ron, you’re right in your email; there’s no way that you were “better” (i.e. cuter) than Leo. If/whenever Sara craves some sticky rice, you know what to do–I’m only 20~30 min away! So welcome to the world Leo!! Want to go to Shad Fest next April? What wonderful news!! I have been thinking about you both!!! We cannot wait to meet Leo – what a cool name – I love it!!! Sara looks amazing – I hope she feels as great as she looks. Little boys are the best – you are in for the adventure of a lifetime & the best part will be watching Leo discover life. Enoy him. He is so precious. Call me if you need anything. All of our best wishes and love. XOXO Heather, Jeff, & Jeffrey! WOW! Congratulations. He is so cute. Lucky you with the short labor. Anyway, we should be joining you in the next 2.5 weeks. We’ll have to have a play date next time we come back to visit NJ. Wow! Hello Leo! He’s a cutie. We are all excited to see him and Sara (and you too, Ron). Welcome to parenthood and hang on to your sanity while enjoying the roller-coaster. I am sure Manan and Sejal will want to leave their own messages for Leo so we’ll have them do that tomorrow. Enjoy every minute of parenthood…i hear it goes by quickly! You could not be entering a better house. It is filled with two of the nicest, coollest – and don’t forget smartest – parents a boy could ever hope for. i can’t wait to meet you, and I’m already counting down the days until you can be taken to the Bent Spoon. WOW!! Congratulations! It sounds like things couldn’t have gone smoother! As far away from the situation as I am, this is really the closest I’ve ever been to the birth of baby. I mean, you casually dropped us off after lunch after getting a call from Sara, and in less than three hours you were a father! It’s really quite amazing. I hope everything continues to go well! Congratulations Ron and Sara! I’m so glad the home birth went so well! You’ve got a beautiful little boy! Congratulations Sara and Ron!! We can’t wait to meet Leo. I’m crying with joy for you. We’ve come a long way since 7th grade!!!! We’ll all be down from MA soon. Can’t wait to talk to you!!!!! Congratulations to you all! He is beautiful and you both look happy and relaxed. Congratulations!! This is the best news we could get in the morning. Leo looks soo adorable, we wish we lived closer to hold and hug him May God bless him and may he have every happiness that life has to offer. We look forward to the day when our boys can play with Leo. He is very beautiful! So glad you had an excellent delivery- how lucky to stay in the comfort of your own home! I wish you all the best- enjoy every moment; they pass by way too quickly! Can’t wait to meet him in person! Leo is SO CUTE and you guys look great! We can’t wait to meet our new cousin! Hey cousins. Congratulations. You guys do everything right. Leo looks good. Don’t let Ilana pinch him. Please give him a kiss from me. You’ll need someone to train him in the ways of the Persian Jedi. Things are going to get more interesting and fun from here. Enjoy, Enjoy, Enjoy. Love Yossi & Linda. I am leaving messages everywhere I guess. CONGRATS!! What a little doll. Are you guys in love or what? 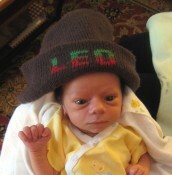 just got off the phone with Leo’s Great-grandfather leonard- he is sooo excited and happy and LOVES the name! We are very excited to meet you soon! Congratulations to you and Sara! It’s the most wonderful event in one’s life! I can’t believe the labor was so short and it happened so fast, we saw you 3 hours prior to birth! Just wanted to say (again) what an honor it was to share the sacred space of Leo’s birth, and how much I ADORE you all! Would love to come see you soon. Welcome to world, Leo!!! Can’t wait to meet you and see your mom and dad again. They are the best!!! You are beautiful and a very lucky boy. We can tell you from experience that your parents are great people to hang around with, so you’re in for a treat. We hope your first days in the world have been peaceful and happy ones- we already know that you’re surrounded with love. Can’t wait to meet you. We LOVE to babysit! Children should be raised in big cities. Move to New York now. CONGRATULATIONS RON!!!! Hey! It’s a perfect match! Let’s set Leo up with our Eliya Bella!!!! She was born April 21st (2nd day of Passover) last week. All the blessings in the world to youz guyz! Your wife looks absolutely beautiful! We can’t wait to meet him! Mazel Tov! we are so happy for u and can’t wait to meet our first cousin once removed …oh wait, is he our second cousin?! either way, he is adorable and we can’t wait to spend time with him. congrats! MAZEL TOV! We are so happy for you guys and can’t wait to meet the little guy, hopefully in July. Sara – Happy Birthday !!!! What an incredible gift for your Birthday (Priceless) !! We are So proud of you ! CONGRATULATIONS ON THE BIRTH OF YOUR SON!!!! LEO IS ABSOLUTELY BEAUTIFUL!!!! I DONT THINK WEDNESDAY CAN COME FAST ENOUGH FOR YOUR MOM AND GRAM THEY ARE PRETTY EXCITED TO MEET THEIR GRANDSON / GREAT GRANDSON…. AND SARA YOUR MOM IS RIGHT HE REALLY IS AN INCREDIBLE GIFT HAPPY BIRTHDAY SARA. WE LOVE YOU GUYS. Congratulations!! He is so cute and adorable. Hope you are doing well. We will try to make it to Joysey to see you guys in the future. Congratulations!!!!! We have been thinking of you. YAY, he was born on our anniversary…. He is sooooooo cute. We wish you all the best!!! When I showed Joey he said AAAAWWWEEE!!!! We are so happy for you!!!! Dear Sara, Ron, & Leo – what a cute little guy [and you can see how “bright” he is already]. I’m glad to hear Leo’s birth went smoothly, but then you set yourself up for success with lots of preparation and positive thinking. I look forward to hearing Sara’s birth story. Are birthing tubs returnable? At least you had it and didn’t need it instead of the other way around. Congratulations on becoming parents. Now I wish you lots of luck with being parents (because your baby won’t always feel like the best baby ever, even though I hope he does). When are you bringing the little darling to Oz so I can meet him? Happy Birthday Leo!!!! Congratulations to all three Rothmans. After waiting a respectable amount of time, Kiri and I will bring food and other goodies. I hope Sara is doing well and I can’t wait to meet Leo! Congratulations!!!!! Little Leo is absolutely beautiful! We can’t wait to meet him. Until then, please keep sharing photos. Congratulations !!! He is just adorable ! Can’t wait to meet him in person. We hope Sara is feeling so good as she looks in the pictures. Enjoy these precious moments with little Leo. Hope to see you soon !!! Welcome little Leo…and congratulations to the proud mom and dad. Wish you guys lots of happiness and all the best in the years to come. Wish we could’ve met up last month when we were in the US. Hey, just wondering if you guys know….Rohit and I are expectiong a baby too. Due end of July. Simran is very excited about having a little brother/sister. So hope to see you guys soon. Take care…and have lots of fun with the baby! Congratulations!!! He is sooo adorable! Don’t forget to teach him a few math tricks while staring at him. We will test him next time we meet him in person . Congrats again. The pictures are wonderful, Lil’Leo is so cute and lucky to have you guys as parents. Happy first Mother’s Day, Sara! Hope it’s a beautiful day for you and your beautiful new son (and for the proud papa, of course!). Sorry we missed your call last night, but we hope to catch up and meet the new Rothbaby soon. CONGRATULATIONS! Yay for daddy and mom! And holy crap, Sara, you look GOOD! That photo of you and Leo behind the beautiful flowering tree branch? Way to raise the bar for post-partum mamas everywhere. Damn. And Leo, you got a rockin’ hairdo. Just checking back in on the wonder of little Leo. Honestly, guys, he is the cutest! And your pictures are fantastic! You both and your family look so happy it is making me cry tears of joy for you and I must join all the comments on how BEAUTIFUL Sara looks, congratulations again and happy belated birthday Sara! Congratulations!! Leo is adorable. We can’t wait to meet him. You can use Yahoo! emoticons. Click on them below, or type the shortcut text: :) :( :-D :-o etc. Comment formatting tips are available.